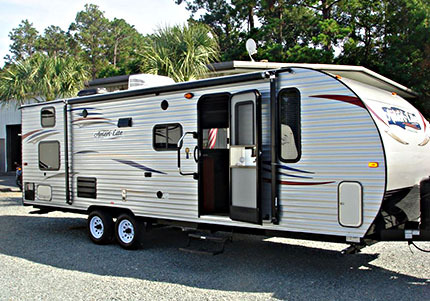 The luxuriously appointed Ameri-Lite line of light-weight trailer and fifth wheels are sure to provide your family with vacation and weekend memories that will last for a lifetime! Ameri-Lite towables feature hand-crafted hardwood cabinet doors, a full kitchen complete with range and microwave, a dinette area with plenty of room, a bath and bedroom and loads of storage space. The Ameri-Lite by Gulf Stream Coach, Inc. offers your family all the benefits of RV living... for less... both dollars and pounds! Voted Top 10 RV by RV Trade Digest magazine.